Nobody likes being sold, which is a problem living in a culture that barrages us with sales pitches and promotions. We all know the statistics -- the average adult sees something like 3,572 advertisements during a typical day. Whatever the number, it's so big that our built-in BS detectors have become finely calibrated, allowing us to decide in an instant whether to pay attention or tune out - like when you're discussing your retirement savings with a Certified Financial Planner and your spidey-senses trigger, warning you of an impending pitch for whole life insurance. It makes me wonder why sales people seem driven to become human pitching-machines, relying on arguing, proposing, convincing and cajoling instead of conversation and dialogue. My friend and colleague Steve Yastrow wondered the same thing, only he decided to write a book about it. 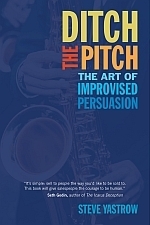 Titled Ditch the Pitch: The Art of Improvised Persuasion, Yarrow states in chapter one, "Sales people go on sales calls armed with PowerPoint presentations, scripted agendas, and preconceived notions about what should happen on the call." Your customer doesn't care about your story. If you are pitching, your customer will stop listening. Your customer wants to talk. It's a one in a million chance that your pre-scripted pitch is what the customer wants or needs. You make the customer do the work of attaching your features to his needs. The thesis of the book is that it's time to abandon pre-written sales presentations and replace them with conversations that are built on the spot as you engage with and learn about your customer. Yastrow favors getting rid of the scripted sales pitch in favor of what he calls "persuasive conversation" and the book includes a page summarizing several differences that distinguish them from each other. A sales pitch is about you; a persuasive conversation is about the customer. A sales pitch is prescriptive; a persuasive conversation is diagnostic. A sales pitch gets more boring as it proceeds; a persuasive conversation gets more interesting as it proceeds. Yastrow introduces the concept of improvisation as the perfect method for training sales teams in the art of persuasive conversation. He references Second City Communications (SCC), the business arm of Chicago-based Second City, the improvisational theatre company whose famous alumni include Bill Murray, Dan Aykroyd, John and Jim Belushi, Joan Rivers, Tina Fey, Stephen Colbert and many others. SCC provides marketing, meeting and training services to corporations like McDonalds, Google, Accenture and Kraft. Yastrow quotes SCC's Tom Yorton, who says, "Good improvisation is all about listening, reacting in the moment, creating, and supporting the ideas of others." For those of you thinking, "I can't do improv -- I'm not funny enough," it's important to know that improvisational selling isn't about entertainment. It's an easy-to-follow, three-step process that requires more openness than innate acting or comedic talent. Turn down your analytical brain. Size up the scene by understanding context and knowing more about who you are with. Create a series of "yeses" and keep the conversation flowing by saying yes AND instead of yes BUT. Find your customer's path and avoid a pre-determined agenda. Focus the conversation primarily on your customer (95%) instead of you (5%). Don't rush the story or bombard the customer with data. These are habits that can be adopted and used by anybody, even people without a funny bone. Actually, they could help you develop a funny bone. While they may not turn you into the next Stephen Colbert, using them will develop your off-the-cuff speaking skill, a useful trait for sales meetings and cocktail parties. What I found to be the best improv concept presented in Ditch the Pitch is something called "callbacks" -- the recurring references found in all good comedy, especially improv. Recurring references, or callbacks, are highlighted and further developed every time they reoccur. Audiences love it, and since every customer is essentially a sales rep's audience, it makes for an ideal selling method. The concept of callbacks can be applied to a sales conversation by repeatedly coming back to statements the customer has made (In response to good, insightful questions, of course! ), highlighting and reinforcing those points each time. I recommend Yastrow's book for any sales team or individual sales rep looking for a better way to make the selling process more productive and pleasant. And I say go ahead, ditch your pitch in favor of a persuasive conversation. Engage your customers in the process by asking good questions, questions that will have them coming up with the answers themselves and lead them to their own conclusions, no convincing required. John Fox is the Founder and President of Venture Marketing, a B2B marketing consulting firm enabling sales reps to win more deals with disruptive, challenger marketing, compelling their customers and channel partners to re-examine how they do things and consider new alternatives. To talk with Venture Marketing and ask your B2B marketing questions, please contact us at Venture Marketing. © 2014 John Fox. All Rights Reserved.